1. The best way to prevent yourself from Swine Flu is to get flu vaccination or flu shot on annual basis. This protects your body from getting infected by the disease. 2. 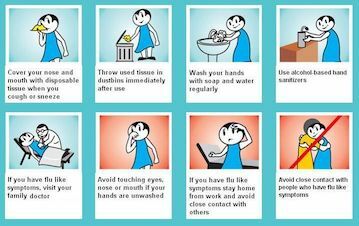 One of the most important preventive measure is to avoid contact with people suffering from swine flu. Coming in contact with the infected person may lead you to catch the virus. 3. Although, the flu does not spread through food. But it is important to have properly handled cooked food. The raw food must be properly washed and cooked. 4. People who are prone to diseases are recommended to wear masks on mouth and nose so that they do not intake the virus from the environment. 5. Have five duly washed leaves of Tulsi (known as Basil ) everyday in the morning. Tulsi has a large number of therapeutic properties. It keeps throat and lungs clear and helps in infections by way of strengthening your immunity. 6. Those who can take garlic, must have two pods of raw garlic first thing in the morning. To be swallowed daily with lukewarm water. Garlic too strengthens immunity. 7. Those not allergic to milk, must take a glass of hot or lukewarm milk every night with a small measure of haldi (turmeric). 8. Aloe vera (gwarpatha) too is a commonly available plant. Its thick and long, cactus-like leaves have an odourless gel. A teaspoon gel taken with water daily can work wonders for not only your skin and joint pains, but also boost immunity. 9. Do Pranayam daily (preferably under guidance if you are already not initiated into it) and go for morning jog/walk regularly to keep your throat and lungs in good condition and body in fine fettle. Even in small measures, it will work wonders for your body's resistance against all such diseases which attack the nose, throat and lungs, besides keeping you fit. 10. Have citrus fruits, particularly Vitamin C rich Amla (Indian gooseberry) juice. Since fresh Amla is not yet available in the market (not for another three to four months), it is not a bad idea to buy packaged Amla juice which is commonly available nowadays. 11. Last but not the least, wash your hands frequently every day with soap and warm water for 15-20 seconds; especially before meals, or each time after touching a surface that you suspect could be contaminated with flu virus such as a door handle or a knob/handle, especially if you have returned from a public place or used public transport. Alcohol-based hand cleaners should be kept handy at all times and used until you can get soap and warm water.